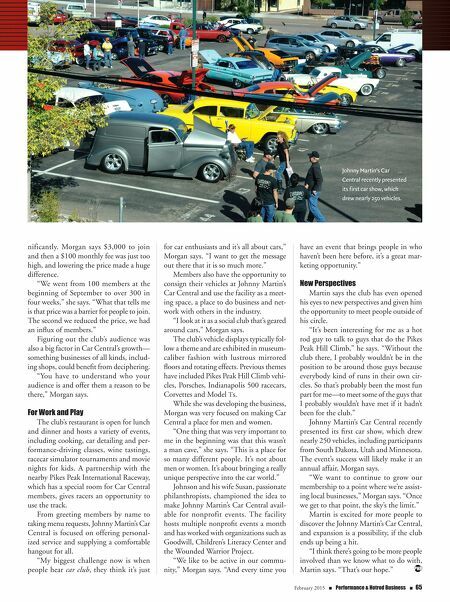 64 n Performance & Hotrod Business n February 2015 ness plan had to be developed from the ground up. As a result, Morgan joined the team as executive director to spearhead the project. Switching Gears "We thought, 'Let's turn that space into a cool car hangout. We can have cars, a bucket of ice and some beers.'" Morgan says. "It was just an organic idea that evolved into this." Morgan, who doesn't have a back- ground in the automotive industry, has developed an appreciation for vehicles and the industry that surrounds them. "I love it," says Morgan, who began a career in the hospitality industry when she was part of the opening team of the Ritz Carlton Hotel in Aspen. "It's been an incredible experience with such enthu- siastic people. There's something about cars that just gets people so excited. And because the cars change constantly, there's always such a won- derful energy in here." Si n c e Jo h n n y Martin's Car Central was such a unique members-only con- cept and most car clubs are associated with racetracks or supply services like v e h i c l e s t o r a g e , Morgan had to figure out how to create an ambiance with services that were going to attract memberships. Consequently, the business plan shifted from just having a simple catering kitchen to building a full- service restaurant operated by a gourmet chef, Morgan says. "We've learned a lot of lessons about the restaurant business and club business, so this year has been super-tough," says Martin, who drives to Colorado Springs at least once a month from Alamosa. "It's a totally different industry than I'm used to. From hiring different types of employees to learning a brand-new business, it's been fun but challenging." 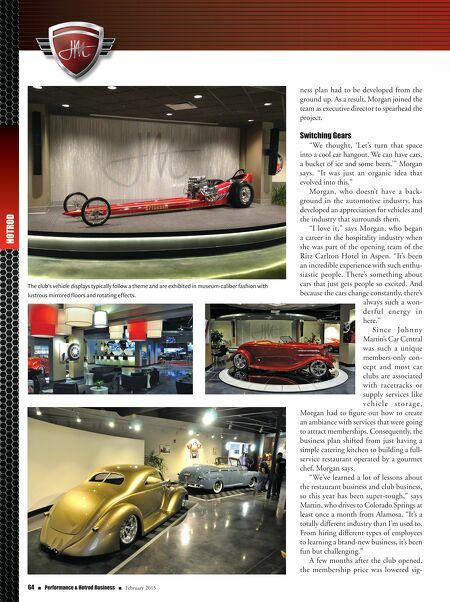 A few months after the club opened, the membership price was lowered sig- HOTROD The club's vehicle displays typically follow a theme and are exhibited in museum-caliber fashion with lustrous mirrored floors and rotating effects.